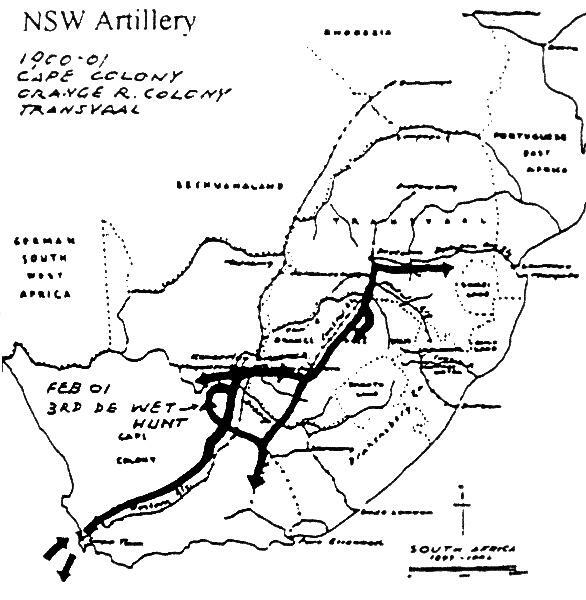 Map illustrating the activities of the "A" Battery, Royal Australian Artillery, New South Wales in South Africa, 1899 - 1900. Murray, P. L., Official Records of the Australian Military Contingents to the War in South Africa, pp. 48 - 52. This unit was formed entirely of officers and men belonging do the Royal Australian Artillery, New South Wales; the officers and men of the Field Battery already in existence being taken as the nucleus, and the strength made up from the Garrison companies. In point of personnel it was, probably; in point of discipline it was certainly, the meat highly classed detail that left Australia for the war. The Royal Australian Artillery, New South Wales, under their "Naval and Military Forces Act of 1871" were subject to the Imperial Army Act and Regulations, and to the Kings (the Queens) Regulations for the Army; therefore the code under which they were trained was a complete replica of that of the Royal Artillery. Thus the men were embarked under a perfect system of organisation. The battery was equipped with six 15-pr. B.L. guns; with their wagons, etc, and supplied in all respects as a complete unit of its arm. It was the only Australian Field Battery sent to the front. This consisted of the brown F:S. uniform, chord pants and puttees; with helmets. The actual Captain of the Battery was Captain H Dangar, who was at the time of departure in South Africa as a Special Service officer. It was expected, that he would join the battery there, which he did. Pay and separation allowance were at the usual rates. The battery embarked at Sydney on the 30th December, 1899, in the transport Warrigal, comprising 7 officers (including Captain G. A. Marshall, A.M.C., and Rev. E. C. Beck, C.E. Chaplain, with relative rank of Major); and 170 non-commissioned officers, artificers, and rank and file, with 148 horses; 6 guns, 6 wagons, 11 carts. Arrived at Cape Town 5th February, 1900. Two of the men died in South Africa. Captain Dangar joined at Cape Town on 6th February, and remained with the battery for some months. On the 15th March, 1901. Lieutenant R: G. King, with a draft of 43 sergeants and sank and file, and 19 horses, left Sydney and proceeded to South Africa, where he joined the battery, and was posted for duty, with the section under Captain Antill, serving with Colonel Williams’ column in Transvaal. The battery having completed about 13 months' arduous service, was ordered home, and the various sections (which had been detached for special duty indifferent parts of the country), having re-united, the embarkation took place on the transport Harlech Castle on 12th August, 1901, arriving at Sydney on 18th September ; having called at Albany, Adelaide, and Melbourne on the passage. "A" Battery, soon after its arrival in South Africa, joined General Settle's column, which was then engaged in clearing the districts of Prieska, Kenhardt, and Goodania, in north-western Cape Colony. In December, 1900, the left section joined Colonel Crabbe’s column, then operating on the Orange River, and remained with him until March, 1901, taking part in the chase after De Wet in the Hopetoun district. Was instrumental in capturing De Wet's guns north of Pompean Pan in February. Also attached to Colonel GrenfeIl's column in Graff Reinet district, operating against Commandants Malan and Kritzinger. The battery was subsequently employed in the Transvaal with Colonel Williams' and Colonel Remington’s columns, and took part iii the operations against the commandoes then in the field. It was unfortunate that the battery, from beginning to end, was split up, and be hardly served at all as a complete unit. Colonel Smith observes in his diary, 25th October, 1900:- " My battery now has its right section at Vryburg, its left at Prieska, and the centre here (Upington), thus covering a front of 360 miles." The sections, however, individually did especially good service. Murray, P. L., Official Records of the Australian Military Contingents to the War in South Africa, pp. 53 - 56. 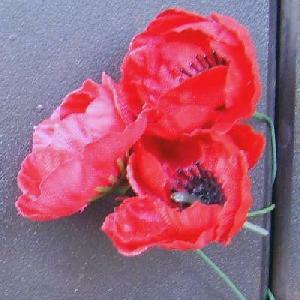 The Roll of Honour contains the names of all the men known to have served at one time with the "A" Battery, Royal Australian Artillery and gave their lives in service of Australia, whether as part of the "A" Battery, Royal Australian Artillery or another unit during the Boer War.